Today was the first time I have eaten in a restaurant (other than Earth Fare’s café) since starting our 100 Days of Real Food. My husband has of course eaten out quite a few times on business trips, but I was obviously not there. Once again today, we were out running errands longer than expected and realized we needed to feed our girls some lunch. I normally like to research these types of things in advance and have a plan, but today I did not. I tried not to look when we passed by Chic-Fil-A (knowing how easy that would be), but we just had to continue on hoping that some sort of solution would magically appear! We spotted the first contender, and I ran in to scope out the menu. A restaurant that is mostly serving sandwiches, burgers and salads unfortunately has nothing to offer us…especially our kids. We can’t eat the bread (the chances of it truly being 100% whole-wheat is slim), we can’t eat the meat (since it probably isn’t local), and like most kids mine just won’t sit down and munch on a salad! Luckily, we didn’t have to go too far though, because right across the parking lot was Pewter Rose (a local place) and they were offering a brunch menu. Right off the bat I knew my kids would chow down on some scrambled eggs or an omelet, and eggs are definitely approved. So we decided to eat there. Once we sat down and started figuring out the details it didn’t exactly start off as a pleasant process. The server eventually had to send out someone from the kitchen to answer “all of my questions”, and based on the answers we ended up crossing more and more things off the list of what we could eat. The hash browns were deep fried, the biscuits were not whole-wheat, the bread may have been 100% whole-wheat but they don’t know the exact ingredients, the bacon was not local, bla bla bla. Despite having to narrow down the entire menu to only a few choices, we did luck out and end up with a delicious meal. I ordered the girls an adult size egg breakfast to share with grits and fruit (instead of non-local bacon or questionable whole-wheat toast). My husband and I shared the shrimp and grits, which was flavored with a cream-based sausage gravy using sausage from a local farm that we actually buy from at our Farmer’s Market. As it turns out I love sausage and I love shrimp and I love grits and it was just so good! I was actually a little embarrassed at how fast I cleaned my plate…what can I say. And not having to do any dishes or clean up was a wonderful bonus and worth the trouble of having to figure out what we could possibly eat at a restaurant. We have been eating pretty well here at home too…although with the mess of course. The other night I had to replenish our supply of chicken stock so I had to think of something to do with the cooked chicken I would have as a result. I also had two big ripe cucumbers from my garden so I combined the two (along with some other ingredients) to make chicken souvlakis with tzatziki sauce. 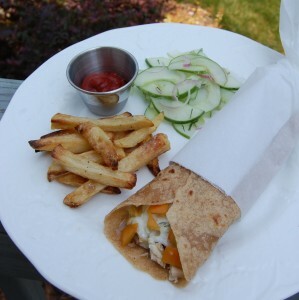 We had them on homemade whole-wheat tortillas instead of pitas with cucumber salad (for the adults) and baked fries with homemade ketchup. It actually turned out to be a delicious meal and the baked fries really were a great substitute for their deep fried counterpart. The ketchup on the other hand was lacking and only served as a reminder of how much I miss store-bought condiments! I guess it must be all that sugar that makes regular ketchup taste so good. Cool info, I will keep my eye on it. I think we were just lacking a little more vinegar we loved ours (we also mixed 3 kinds of tomatoes…which helped too. I have a question about eggs. Do you not worry about buying caged chicken eggs instead of fresh eggs from the farmers market? I try to purchase only farm fresh eggs from the local market or friends that sell them, I agree that cost about double or triple, but I feel better knowing they are fresh and no chicken is caged permanently for mass production. I apologize if you have already covered this, I am not finished reading your 100 day blog. We do buy fresh pastured eggs from our farmers’ market….I agree it’s worth the price. I’m a little confused about how grits are “approved.” Aren’t they made from hominy, which is soaked to remove the hull and germ?